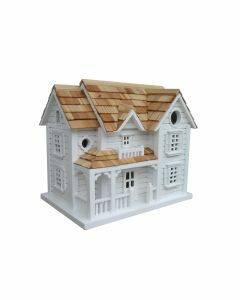 This functional birdhouse is inspired by the iconic Star Barn in the heart of the Amish Country near Lancaster, Pennsylvania. Stars decorate all around this country classic with a river stone foundation. This house has a removable back wall for easy cleaning, with two individual nest boxes separated by a wall. 1.25” openings will invite wrens, finches, chickadees and nuthatches. Item Dimensions: 19” H X 18″ W X 8″ D. Click on image for greater detail.